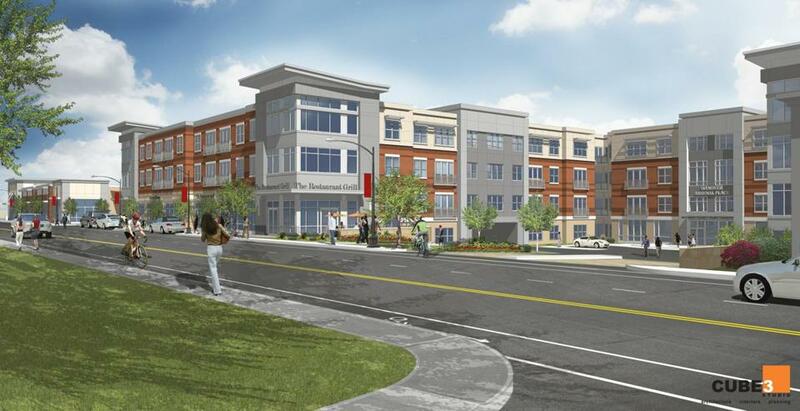 A rendering of the proposed Arsenal Street Development in Watertown. Watertown planners are reviewing a proposed development for Arsenal Street that would add 300 residential units and 37,100 square feet of retail and restaurant space to the area. Developers from the Hanover Co. submitted a plan last month to raze a vacant industrial building and other offices at 202-204 Arsenal St. and 58 Irving St. to make way for the mixed-use complex, said Watertown planning director Steve Magoon. The commercial space would likely house shops, at least one restaurant, and possibly a grocery store, Magoon said. The site plan is being reviewed by town planners, and a formal proposal will be presented to the Planning Board this spring, he said. Planning Board chairman John Hawes Jr. said he thinks the Arsenal Street corridor will be the next section of Watertown to see major changes, especially as Athenahealth Inc. and Boston developer Boylston Properties announced last summer that they would buy the Arsenal Mall and two nearby properties. The companies hope to transform the nearly mile-long stretch into an area teeming with loft apartments, hip restaurants, and trendy boutiques catering to entrepreneurs and technology workers at nearby companies. “I think the Arsenal corridor is the next area that’s going to be looked at carefully,” Hawes said, noting that town officials are considering a variance request from Boylston Properties for a seven-story hotel on the former Charles River Saab site near the Arsenal Mall. Hawes said he hopes to see projects providing a combination of residential units, retail space, and offices for research and development companies. Hawes said that he also hopes to see more family-friendly residential developments, with larger units than the one- and two-bedroom apartments usually snapped up by young professionals or empty nesters. Hawes said he has not formally reviewed the 202-204 Arsenal St. development plan, but has heard about it, and prefers the proposal to a big-box retailer. Still, Hawes said he is expecting neighbors to express apprehension and he will seriously consider any concerns they might have. Some proposals that have come before Watertown in recent years, particularly in the so-called Pleasant Street corridor, have sparked opposition over traffic, parking, pedestrian safety, environmental concerns, and aesthetics. A proposal for a 14-unit condominium complex at 192 Pleasant St. was rejected by the Planning Board last spring following neighborhood opposition. In November, the board approved a special permit for a 65-unit mixed-use complex at 60 Howard St. and 45 Bacon St., where Circle Supply used to operate. The proposal for 202-204 Arsenal St. is outside of the Pleasant Street corridor, which runs west of Watertown Square along the Charles River, but Magoon said he wouldn’t be surprised to see concerns raised by residents. “After everything with Pleasant Street, any project in town will have increased scrutiny,” he said. However, Magoon said, Watertown residents should weigh the benefits of the proposed development on Arsenal Street. “I think from the town’s economic development perspective, it’s important to move forward,” he said. Colleen Sexton, a vocal opponent of large-scale developments in her neighborhood along the Pleasant Street corridor, said she worries that traffic would become even more congested in the center of town if the Arsenal Street proposal goes through as is. Sexton said she was also concerned by the large scope of the project, suggesting that the Planning Board might do well to drastically reduce the number of residential units before approving the project. “I would caution the board against the things we’ve seen in the Pleasant Street corridor, and hope they take these concerns seriously and learn from what’s happened here,” she said.